Our gardening theme continues with The Enormous Potato Click Here. After reading the story, talk about the sequence. Who pulled the potato first, after that? Talk about other things that are enormous: elephants, tractors, and tall buildings to name a few. Was the mouse the strongest or was it cooperation that caused the potato to come out of the ground? What other things are better when we cooperate (cleaning up goes faster if we all cooperate, dad and mom are calmer when brothers and sisters cooperate and get along). What is a potato eye? Next time you are at the grocery store (or if you have them at home), see if you can find a potato eye on a potato. Talk about all the things that can be made from potatoes: fries, baked, tator tots, potato chips, hash browns, mashed potatoes and potato soup are a few. Choose one or two and prepare them for dinner! This week we will read, Growing Vegetable Soup. If you can, check it out at the library, if not watch here There’s a lot for a preschooler to learn about gardening! Ask your child to name their favorite vegetable. Does it grow above the ground or under the ground? Vocabulary: tools, rake, hoe, sprouts, weed, roots, stem, vine, raw, and cooked. Click on LANGUAGE EXTENSIONS AT HOME on the right and read through the poem! I am reading a book called I Like Myself Click Here instead of Stellaluna. The moral of Stellaluna is to like yourself just as you are and to try not to change yourself, so this book fits right in. If you read I Like Myself, or Stellaluna, talk afterwards about what your child likes about him/herself. Put a note under his/her dinner plate each night for a week that tells one thing that you like about your child. This week we will use the Smart Board and categorize things that bats do and things they don’t do to learn facts. We will also categorize things that fly and things that don’t fly. We will sing a song called I Know a Chicken (do chickens fly?) Click Here and we will follow 2 step directions to find toy bats around the room. Don’t forget Language Extensions at Home on the right side of this blog to find our sound this week for the Surprise Bag. Please read through the poem! 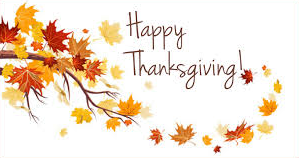 I hope you all had a great Fall break. In no time at all we will be planning for winter break! I want to remind everyone, since I have been getting some questions about Surprise Bags, that our sound is available in LANGUAGE EXTENSIONS AT HOME on my blog page. You have to click on the current week (they are not in order and I don’t know how to fix that, sorry) according to the date. The poem will always align with the sound for the Surprise Bag- Sorry Highland Park, this does not apply to you since Ms Vest does your Surprise Bags when I am not there 🙂 . I put the poem on that page as well as activities for you to try. I want you to access that page so I put the Surprise Bag information there. My blog is always updated on the Friday morning before the week starts. Thanks so much. Hope that clears up any confusion! Our story this week is about a firefly that sees different things that light up as he looks for a friend. When reading the book, stop to use ordinal words like first, second, and third (first the firefly saw a lightbulb, second he saw a candle, etc.). Use synonyms or describe new vocabulary words (the light ‘flooded’ the night- that means the light was everywhere! reflection– show them a mirror or google pictures of reflection). A fun activity might be to turn out all the lights in a small room in the evening, grab a couple of flashlights and move the light to some music like a firefly. Don’t forget to click on the Language Extensions At Home to the right. This is our week to review and assess. Use and re-use this vocabulary. I have read that “research” suggests you need to be exposed to a new word about 30 times before you “get it”. over, under, big, small, tall short, between, long, to, from, inside, outside, weak, and strong. Next week we will read The Very Lonely Firefly. Please don’t forget to read the Language Extensions at Home. This page has our poem. PLEASE read through the poem at least once with your child so they will know the vocabulary that begins with our sound. Thank you!!! Thank you again to all of you who have been checking out this blog weekly and sending in the Surprise Bags with three clues! We have not completely understood the guessing part of this activity, but we are learning. Classic children’s books have captivated children for years. 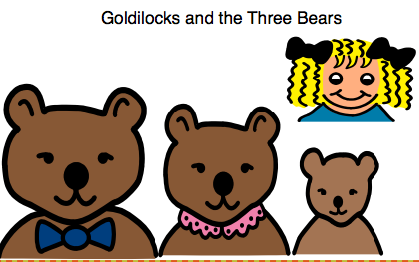 Did you know that the story of Goldilocks and the Three Bears was first published in 1837? The original story was much different than the versions published today. When you read this book with your child, the repetition of the three actions, three times(someone’s been eating my porridge, someone’s been sitting in my chair and someone’s been sleeping in my bed) allows them to ‘read along’ with you. This is also a good book to reference respect as well as using/taking things that don’t belong to you. Don’t forget to click on the Language Extensions At Home in the right column. We are continuing with the transportation theme this week. The book I am reading is, Who Sank the Boat? The link is included on the Language Extensions at Home page. This book can help us with prediction skills. When you read any book with your child, stop before turning a page and ask, “What do you think will happen next?”. We may use a scale to show how adding just one tiny item can cause the scale to tip, just like the boat in our story. You can do this in the bathtub with a bath toy. Add items to the boat until it sinks. Count how many items it took to sink. Try the experiment again and add different items. Did it take the same number of things to sink the boat? Play a ‘will it sink or float?’ game in the tub. Gather items (sponge, rock, foam letter, spoon etc.) and guess if it will sink or float before dropping it in the water. You are encouraging scientific skills in your preschooler! 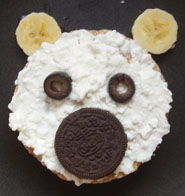 Another fun snack to make. Talk about part and whole when cutting the apple. 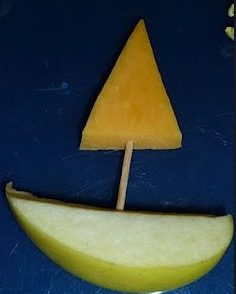 Talk about shapes, textures (hard-apple, soft-cheese, smooth- apple and cheese, rough-pretzel stick). This week I will be reading Freight Train. It’s a good book that uses a few concept words (across, back, next, through, cross, light, dark). These words help us navigate with directions at school such as. ‘ Move your finger across the page as you read’, ‘Go to the back of the line’, ‘ You can take a turn next’, and ‘Cross the line before you start running’. If a child does not know the meaning of concept words, it may appear as though they are not following directions. Freight Train also teaches color words and the different ‘job’ for each type of car on a train. While you read, ask questions like, “Can milk can be transported in a hopper car? Why not?”. “Can people travel in a tank car? Why not?”. Play a train game. Sit down and make ‘tickets’ together. Make a train by lining up chairs. Choose a train conductor (wear a special hat) and have the conductor collect the tickets. Ask where they are going and why. Substitute bananas for the wheels and put different cargo (popcorn, carrot pieces) in the cars! 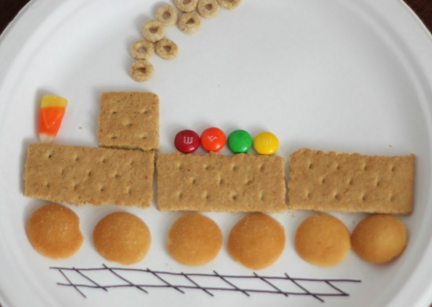 If you think of something fun that you do with your preschooler, comment in the blog! I’d LOVE to hear from you. 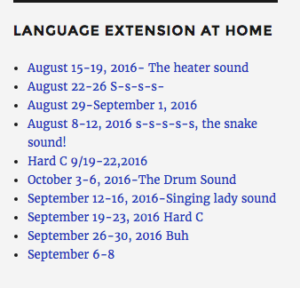 Click on the Language Extensions At Home on the right for activities with the /l/ sound. This week we will be checking to see what the students have learned. 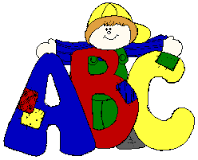 There are no new letters, sounds, shapes, colors or books this week. Talk with your child about everything we have learned at school. Use the vocabulary (student, schedule, alphabet, senses, scent, taste, vehicle). Use the concepts (short/long, to/from, big/small, between) when talking with your child. So far we have read: Spot Goes to School, The Kissing Hand, My Five Senses and Owen. 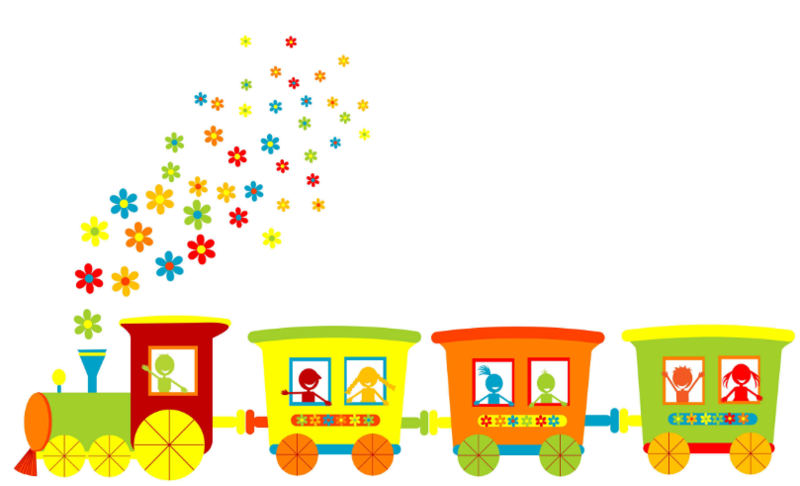 Beginning the week of September 12th we will learn and read books about transportation. Click on Language Extension At Home to the right.